Our ‘Mygration Story’ series tracks the family histories of staff and fellows at UNU. The aim is to show that many of us owe our lives and careers to the courage of migrant ancestors. People who left their homes to build safer or better lives — for themselves and for their children. With this series we want to show that migration is not an historical aberration, but a surprisingly common element in family histories worldwide. These days when asked where I am from, I usually say Hawai’i. Honolulu. It is the simplest answer and the one that is most rarely followed by that dreaded question – ‘but where are you really from?’ – that regularly comes when I say the United States. It is not so much that I find this question offensive, though I understand why many do. It is more that I find it tiring, requiring longer explanations and clarifications than I usually want to give someone I have just met – someone who has just kicked off a conversation by implying – wrongly – that those ‘really’ from the US do not look like me. But there is some incongruity here. And I do like to talk about ancestry, family trees, and histories of migration. I was the child who asked for endless family stories, poring over old photo albums. Why did this family member move, or stay, or return? As an adult, a scholar of ethnic politics, I puzzle over related questions of identity. How do we identify and how do others identify us? Which among the many disparate ‘ethnic’ elements of who we are (often rooted in histories of migration), do we privilege? What are the implications of such identifications for politics and society, for elections, conflict, and development? Ethnic identity, I teach my students, is ‘constructed’. Beware simple journalistic explanations of ethnic conflicts that somehow hinge on the ‘primordial’. Identity is rarely fixed and always contextual: Everywhere else but Hawai’i, I may be ‘from Hawai’i’ – but not there. In Hawai’i, I was ‘hapa’ growing up, and now more than 20 years after I moved away, I am rarely seen as ‘local’; ‘from the mainland?’ perhaps. Hawai’i is where I completed elementary and high school and where my mother and most of that side of the family live. All four of my mother’s grandparents migrated there from Japan in the early 1900s. Like so many others, my grandfather’s parents worked the sugar cane fields. The path of my grandmother’s parents was less typical in its outlines: the second son of a merchant family seeking ‘adventure’ and an educated young woman from Hiroshima. The latter, Yoshiko, was the only one of these four still alive when I was born. A formidable woman, she spent most of her adult life as a school teacher in the small Hawai’i town where she raised six children. It was Pāhoa where my grandparents grew up and fell in love, but Mississippi where they married. It was the Second World War and my grandfather was in the (US) Army, stationed there for training. My grandmother had somehow worked her way across the Pacific and the continental states, eventually settling for some years in New York City. Sometime after the war, my grandparents moved back to the Island of Hawai’i, where my mother was born. It was my mother’s high school guidance counsellor who recommended the college in the Midwestern US state of Minnesota, where my parents met. This college was not that far from Minneapolis, where my father grew up, but the way I heard it as a child, it always seemed to me more challenging for him to get there. His family had had their hearts set for him on St. Olaf College instead – also in Northfield, but with a stronger religious (Lutheran) tradition. My father’s grandfather, John O, was an early leader in the Lutheran Evangelistic Movement and the ministry was important to the family. Like many Minnesotans, my father’s roots trace back to Scandinavia; migrants who came in the late 1800s to settle on Midwestern farms. John O’s father, Ole, was from Sweden, hence our Swedish surname, but his mother and a number of our other relatives were from Norway. Biological lineage here only tells part of our story: my grandmother on this side, Marilyn, is my father’s stepmother. Because his mother died young and the families blended in the interests of the children, I grew up with three sides to the tree in my father’s family, and Grandma Marilyn’s roots are more Swedish. When I was a young child, however, I lived with my parents in none of these places. I was born in Bangkok, Thailand, and before my mother and I moved to Honolulu when I was seven, had lived in three countries and three US states because of my father’s studies, research, and work. For many years, I considered Bangladesh my second home (after Hawai’i). Bangladesh is the country setting of my earliest memories (aged 3), and it was my father’s base for many years, where I lived when with him. But the place I have been based the longest is in fact Cambridge, Massachusetts. Cambridge is the home of my early adult life, where I did my graduate studies and later worked. Honolulu follows in terms of years, and then Helsinki, where I now live with my husband and children. I have no quick, accurate answer beyond simply my citizenship. My husband, I think, has a clearer response. Omar was born and grew up in London. His parents migrated there from Guyana in the 1960s. He holds British and Guyanese citizenships, with historical roots in India. Our five-year-old recently told her teacher that she is Finnish, which prompted a lot of discussion in our home. Should this really have surprised us? She does not hold a Finnish passport, but Finland is the only country in which she has ever lived. If she is not from here, then where? Until last year when she moved to an international school, she attended the local municipal daycare, entirely in Finnish, with (mainly) other Finnish children, the same one our two-year old son now attends. While Omar and I live and work in an English-speaking and largely international bubble, and would not claim to be ‘from Finland’, the same is not true for our kids. The writer Taiye Selasi gave a powerful TED talk a few years ago that has stuck with me. ‘Do not ask what country I am from,’ she advises; ‘ask where I am a local.’ Do not privilege ‘a fiction, the singular country, over reality: human experience’. But the more I think about it, this is not quite right for me either. Yes, today I feel myself a local in Helsinki, but will I say the same in 10 years’ time? Is ‘home’ for me even – consistently – a locality? Cambridge today is not the Cambridge that was my home in the 2000s. Nor is Dhaka, Bangladesh, of the 1980s, Washington DC, USA, of the 1990s, Niamey, Niger, of 1995, La Paz, Bolivia, of 2004-05, and so on. Even Honolulu, the city I visit most regularly, is not a fixed place to which I can ‘return’ home. And even if I could somehow (re-)build a ‘home’ rooted in the one I left at 18, would it ever be ‘home’ in the same way for those I would bring with me – my Helsinkian children and British-Guyanese Londoner husband? Perhaps this dilemma is one shared by many migrant families – and many ‘mixed’ migrant families in particular. When our lives are marked by migration, those closest to us, our partners and children, can also be in some ways ‘foreign’; individuals whose answers to the question ‘where are you from?’ will differ naturally from our own. Beyond the small space of the flat in which we live together, is there any single place that we are all ‘really’ from? 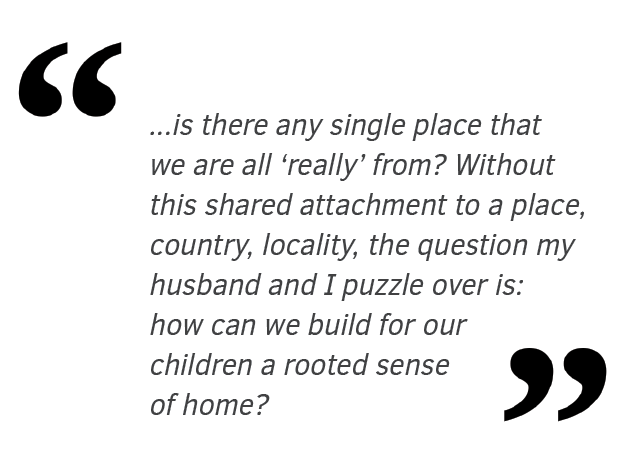 Without this shared attachment to a place, country, locality, the question my husband and I puzzle over is: how can we build for our children a rooted sense of home? Rachel M. Gisselquist, a political scientist, is a Research Fellow with UNU-WIDER. 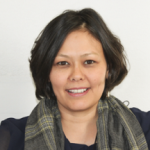 She works on the politics of the developing world, with particular attention to ethnic politics and group-based inequality, state fragility, governance, and democratisation in sub-Saharan Africa. She has field experience in multiple contexts, including in 24 African countries, with longer-term research in Benin, Bolivia, and Niger.